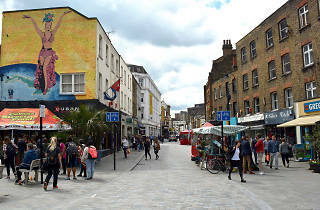 A short walk from Waterloo station and the Old Vic theatre, Lower Marsh is a historic south London street in transition. Built (as its name suggests) on former marshland, it has been home to a street market since the mid-nineteenth century, and in the past decade the underrated Zone 1 enclave has embraced the first flush of gentrification. Don’t panic: charity shops and greasy-spoon caffs remain, though you’ll now find them in between trendy coffee shops, quirky independent retailers and some cute places to grab a drink. On weekdays, workers from nearby offices flock to a long line of food stalls offering cheap eats from all over the world, and a new branch of the super-fancy Hoxton Hotel chain is being built just around the corner on Waterloo Road. But this doesn’t mean Lower Marsh has vanished up its own arse. You can still pick up a greasy Greggs pasty if you fancy one; a rare (for Zone 1) branch of budget supermarket Iceland always seems to be busy; and famous gay sauna Chariots stakes out a prime spot halfway up the street. 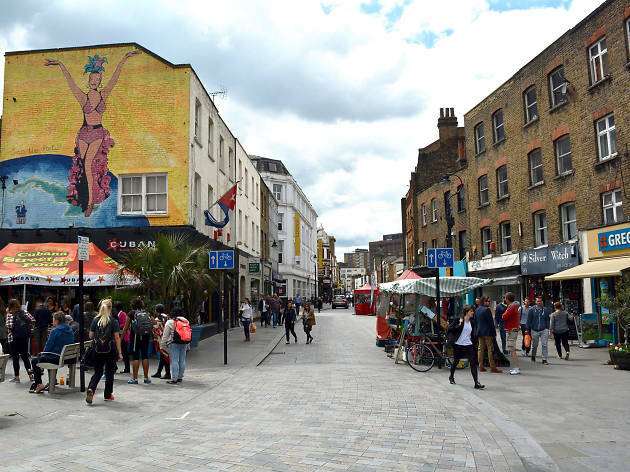 All in all, Lower Marsh is definitely worth delaying your next train out of Waterloo for. Just be wary of visiting on a Sunday, when most of the shops and cafés are closed. Yes, in 2016. What do you expect from a street that sounds like it’s named after a Somerset village? Dairy-free flat whites at Love & Scandal, a cool coffee shop that’s recently gone vegan. A flawless espresso at the stylish and highly rated Coleman Coffee Roasters. Zingy Cuban cocktails by the glass or jug at Cubana, which also serves fab food (and featured extensively in the film ‘One Day’, rom-com buffs). A Campari and soda, surrounded by vintage treasures, at the eccentric Scootercaffé. Craft beers or a glass of prosecco in the cute garden at Café del Marsh. A pint or a G&T at the excellently named Camel & Artichoke, an unpretentious pub that’s larger than it looks from outside. Hearty English breakfasts or tasty Thai food at Marie’s Café, a local institution that’s been culturally multitasking for years. Scrumptious, authentic Korean food at low prices from Po Cha. Old-school Italian cuisine at La Barca, a charming restaurant celebrating its fortieth birthday. A generously filled open sandwich at the new Borough Produce Café. A fresh-baked brioche or Chelsea bun at friendly coffee shop Four Corners. Food and groceries from top local suppliers, such as The Ginger Pig butchers and Clapham’s Old Post Office Bakery, at Greensmiths. Stylish children’s clothes and beautiful, interesting toys at Little Marshans. Unusual and affordable jewellery made of silver and semi-precious stones at Twice the Siren. A guide to your next holiday destination at Travelling Through, an arty independent bookshop with its own café downstairs. Try out knitting over a glass of fizz at I Knit London, the only knitting shop in the UK with a booze licence. Watch a play or take a life-drawing class at The Vaults, a versatile arts space in a series of interconnected underground tunnels beneath Waterloo station. Grab some lunch or pick up a snack from Lower Marsh Market. Its stalls have everything from Senegalese food to homemade lasagne, all day from Monday to Saturday. Vote for your favourite spots in Waterloo and Southwark in this year’s Time Out Love London Awards – then check out more of the best bits of London. It is great to see the Market getting established again, although there are food stalls with a fantastic variety of cultural 'street' food there are traders selling quality fashion and accessories, products you wont find on the high street. It's a great place to spend some time and shop for something special.